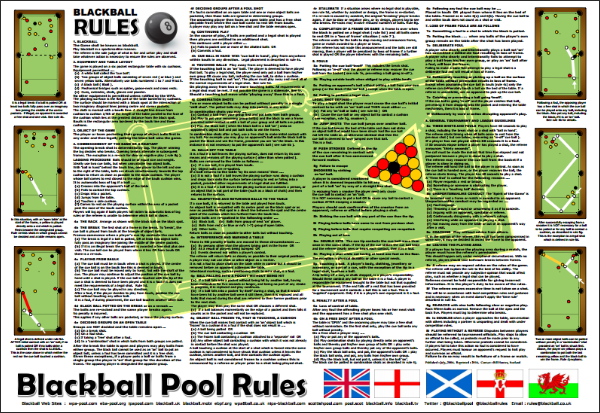 The following is a comprehensive visual guide to blackball pool rules as sanctioned by the World Pool-Billiards Association (WPA) as played throughout the United Kingdom and indeed worldwide. This is the original page compiled with the help of a senior WPA official* upon the introduction of blackball in 2005. It has subsequently been updated to show minor rule changes. From the opening break to the completion of a frame, here's an explanation of general play, legal and illegal shots, play resulting in fouls or loss of frame, combination shots and more. Rack the balls with the black ball positioned at the intersection of two imaginary diagonal lines as shown in the diagram. The lag winner decides who breaks. Opposing players break alternately in successive frames. Position the cue ball anywhere within baulk before breaking. 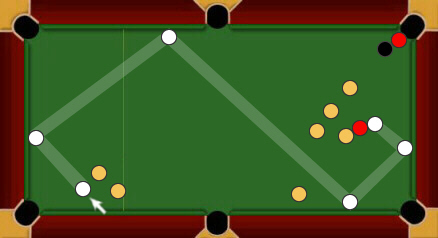 To achieve a legal break at least two object balls (reds, yellows or black) must completely cross an imaginary line joining the middle pockets. Alternatively, at least one ball must be potted. 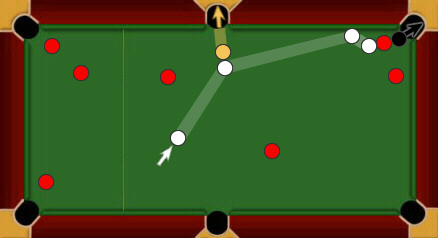 If no balls are potted and two object balls do not pass over this line, then the oncoming player is awarded 'one free shot and one visit'. The cue ball may then be played from where it lies or from baulk. Alternatively, the oncoming player may request a re-rack. It is also a foul if the cue ball is potted on the break. The retrieved white must be played from baulk. If the black is potted the table is set up again and the same player breaks. On a break shot, no matter the outcome, the table remains 'open'. Groups are never decided on the break. There is no 'nomination' of groups with blackball pool rules. When a foul is played on a shot. When taking a free shot after a foul. 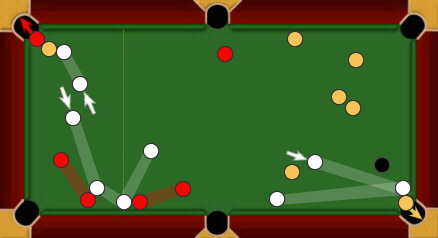 Where a combination shot is played in which balls from both groups are potted. 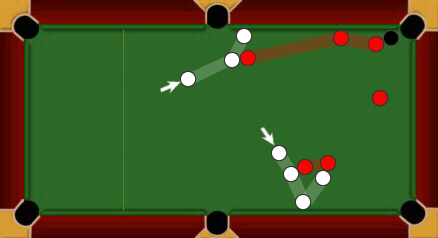 With the exception of those aforementioned situations, if a player pots a ball or balls from a single group the player is then 'on' that group for the duration of the frame. 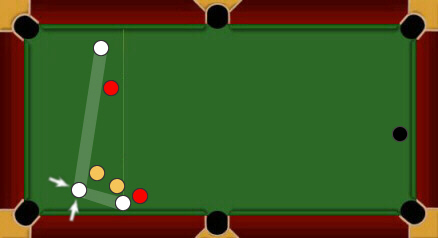 So, above, potting only the red in the middle pocket would determine 'reds' as that player's group; but pot both red and yellow in a combination shot and the table remains open. If an 'open table' (that is groups have not been decided) players may play the cue ball to strike a ball from either group (reds or yellows). 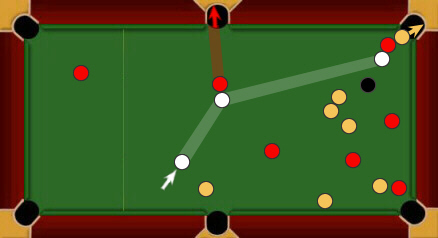 In the above scenario, with an open table, a yellow ball has been played directly onto a red which in turn drops into the pocket. That player's group then becomes reds. A number of exceptions are described at '3' above in which an open table situation could continue. Remember that the black cannot be used as a ball to pot another object ball unless a foul has been committed and a 'free shot' has been awarded to the oncoming player. (b) Cause the cue ball or any other ball to contact a cushion. An 'on' ball might include balls from either group or the black if a player has a 'free shot'. 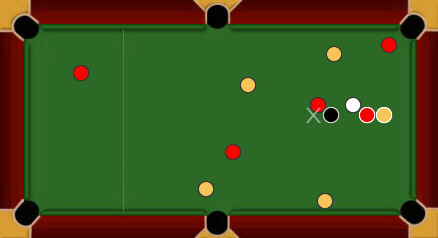 In the situation above, if the red ball falls short of the pocket and no ball strikes a cushion after the cue ball hits the red, then the referee calls a foul. There is one exception to this definition.... escaping from a snooker, which is described below. A player is 'snookered' when it is deemed impossible to strike any part of an 'on' ball by way of a straight line shot... which is the case in the the above diagram. Players should seek confirmation that it is a 'total snooker' from an opposing player, referee or other official before attempting to play out of a snooker. A direct consequence of the need for a ball to strike a cushion after contact with an 'on' ball is that it is not possible to simple tap up behind a ball to lay a snooker. Here, in the upper shot, to lay a snooker on the black ball, either the cue ball or the red must touch a cushion after the red after has been struck. Similarly, in the second scenario, the white gently glances against a red ball before it hits the cushion. This results in a snooker behind two reds. 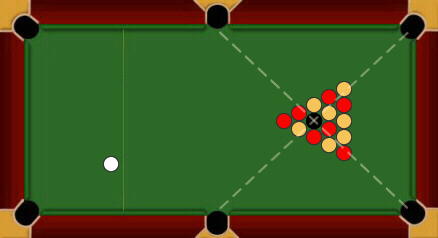 In this case, because it initially touched a red ball, the cue ball need not necessarily reach the two reds before it comes to rest behind them off the cushion. There's an exception to the requirements of a legal shot as defined at '5' above. When successfully escaping a snooker, as in the diagram, it is not necessary for a ball to touch a cushion after the object ball has been struck. It is sufficient for the cue ball to simply make contact with an 'on' ball. It follows that in escaping a full snooker by way of a 'swerve' on the cue ball, it is not necessary for any balls to strike a cushion during the successful execution of such a shot. At any stage in the game, balls which leave the table are returned to the playing surface. If the cue ball, then it's played from baulk. Balls are always 're-spotted' on, or as close as possible to, the black spot in a direct line between the spot and the end cushion which is closest to that spot. 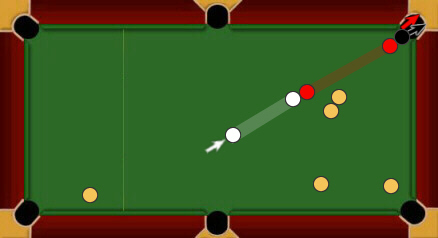 Above, three object balls (red, yellow and black) had left the table on the break. In this case, with an 'open table', object balls are replaced in order of black, red and yellow. Return balls to the playing surface in a straight line, as close as possible, without touching. When not an open table a black ball is again always returned first but is followed by any ball or balls from the group of the player just about to play... that is of the 'on' player. Two or more object balls can be potted without penalty in a single shot. These may be balls from both groups and could include the black ball. In such shots the balls can drop into pockets in any order. The object ball with which the cue ball makes initial contact must be a ball which can be legally struck. A combination shot might be used to clear an opponent's ball which is 'blocking' a pocket. In the situation depicted the player on reds plays a combination. Sinking both the red and yellow creates an opportunity for the player on red balls to clear the table. Players may sink their last remaining group ball (or balls) and the black in the same shot and so win a frame. Initial contact, as always, must be with an 'on' ball. In this instance the player on yellows pots the final yellow ball and in the same combination shot wins the frame by potting the black ball. 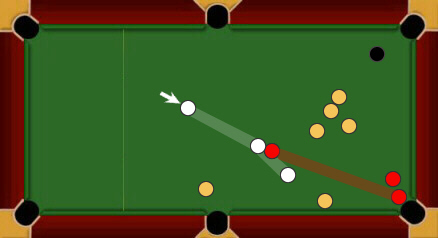 In certain circumstances a combination shot can be played in which two balls are potted in a single pocket. 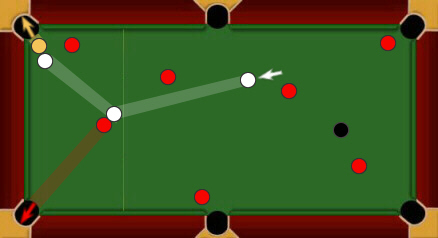 In this example the red ball is struck and directed in such a way as to pot the black and then to follow through to drop into the same bag and clinch the frame. After a foul the oncoming player has a 'free shot' and may play onto any object ball on the table. Here, the player on reds may legally strike and pot the black ball and then, in the same shot, sink the last remaining group ball to win. Potting only the black would of course result in loss of frame. It is necessary to play away from any object ball declared to be touching the cue ball. If, in doing so, the touched object ball moves, then it is a foul. If the cue ball is touching a ball from your own group (or indeed any 'on' ball) then that object ball is regarded as having been 'struck'. When playing away from a touching ball it is necessary to meet the requirements of a legal shot. That is a ball must be potted or a ball strike a cushion. Above the player is on reds. The cue ball is deemed to have struck the touching red. 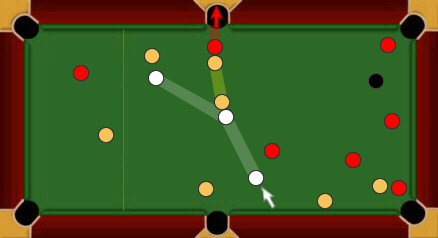 The player takes advantage of this opportunity by playing the cue ball onto the cushion and laying a snooker. If playing away from a touching ball 'not on' the requirements of a legal shot must be met plus the initial contact of the cue ball, on playing the shot, must be with an 'on' ball. In this scenario the cue ball is touching a red ball. The player is 'on' reds and is considered to have struck the touching ball when playing the shot. By striking the yellow it's possible to sink the red over the pocket. The player then has an excellent opportunity of winning the frame. Following a foul the table is declared 'open' and the oncoming player takes a 'free' shot. In doing so it is permissible to play onto any object ball. Any ball may be potted, including the black if it is 'on'. In each of the three situations above, the player taking the free shot is 'on' reds. To the top left, a shot is legally played on to a yellow to sink a red ball. Bottom right, an opponent's yellow ball is played to clear the way to pot the black later in the frame. Finally, bottom left, the player uses a free shot to bring two red balls into play. A player who clearly fails to attempt to play an 'on' ball OR deliberately plays a ball which is 'not on' will lose the frame. The player's group is red in this image. Only the black remains to be potted, but the player is snookered. There is a possible shot, up and down the table, to escape the snooker. If in playing up and down the player is considered to have made little attempt to make the shot (for example by leaving the cue ball well short) there is a risk of losing the frame for playing a deliberate foul. The decision is with the referee. The alternative call would be a 'standard foul' giving a free shot. The player could (unwisely) decide to strike the nearest yellow and in doing so might open up access to the black. This is undoubtedly a deliberate foul and results in loss of frame. Here the player 'on' yellows intentionally plays a yellow ball onto a red which is potted. The player was NOT on a 'free' shot. In striking a ball from his own group first the player has fulfilled the requirements of a legal shot described above. It is however a standard foul for potting an opponent's ball, but it is not loss of frame. This may be regarded as a tactical option. The player on yellows pots a red in the expectation that, despite the award of a free shot to the opposing player, that player will not finish the frame. The hope is the red balls are so badly positioned the player on yellows is the most likely frame winner. Where no legal shot is playable, whether this be by accident or design, the frame will be re-started. Top right, the black and two reds remain on the table. The player is 'on' the black. 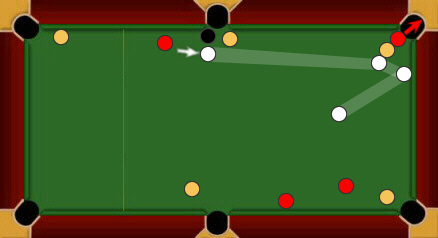 The cue ball cannot pass beyond the reds to strike the black. This is a 'stalemate' and there is a re-rack. Moving clockwise, the cue ball is touching the black and must be played away from that ball. The player is on reds. However, regardless of the direction in which the cue ball can be played, what matters is the space between black and yellow. 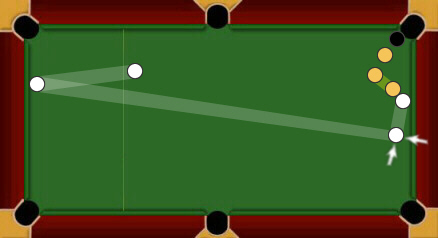 If the cue ball is able to pass through that gap then it is theoretically possible to play a legal shot and the player must attempt to do so. In the final example a legal shot can be attempted, although it's unlikely to be successful. There are two pathways to the black ball between the reds, so it's NOT a stalemate. 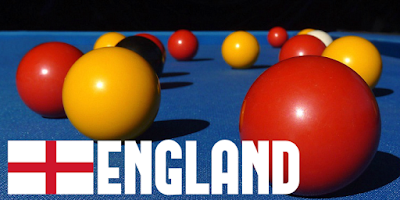 The game of blackball is played extensively in pubs, clubs and pool leagues. There are numerous national and international events. 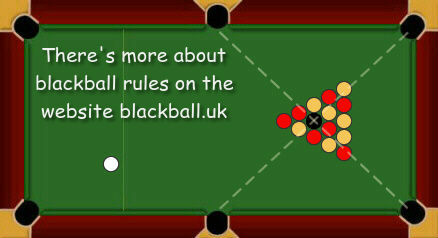 There's news, articles and a good deal more on the rules of blackball on this website. 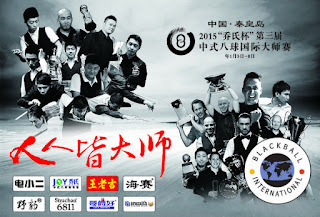 Comments and queries about blackball pool are welcome. This content may of course be freely reproduced (it has been extensively) but accreditation and/or a link to the web page blackball.uk would be appreciated. There's also a overview of the rules on this website in a format suitable for downloading and printing. * The above guide and accompanying images were created with the assistance of the late Peter Hawley and first published online by Bill Hunter in 2005. The guide was revised in 2008 and 2015. Peter was Vice-President and Treasurer of the World Pool-Billiard Association and pioneered the introduction of blackball pool. A great ambassador and tireless worker for the sport, Peter was also President of the All Africa Pool Association. So in #17 if the white is played up and down the table and stops in the position shown is that always loss of frame? Not necessarily. The decision is with the referee and can be tough to make. If the referee is convinced a genuine attempt has not been made by a player to escape a snooker then it is loss of frame. Otherwise it's a 'standard foul' giving a free shot. Image 10 you pot the yellow and its not a foul!!! It's a legal 'combination shot'. 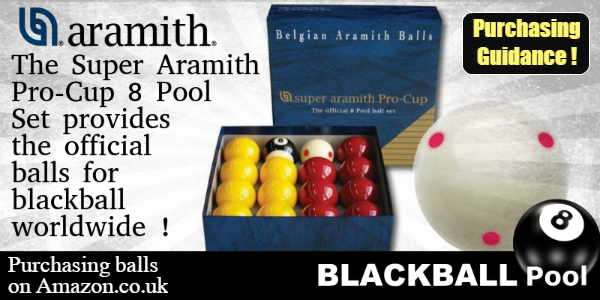 Players unfamiliar with blackball sometimes criticise the rule which allows balls from both groups to be potted in a single shot. Critics may say that the rule promotes a hit and hope approach to play. In fact, as any reasonably competent player knows, potting balls from both groups by chance does not in fact happen very often. Intentionally potting both red and yellow balls in one shot requires skill. It also contributes to a faster more open game. It is a standard foul and the black ball is returned to the table as in image #9 above. If I am on the black, shoot and pot the black, only for the white to then pot my opponents ball, do I still win the frame? ie do I still win if I pot the black and then pot an opponents ball? 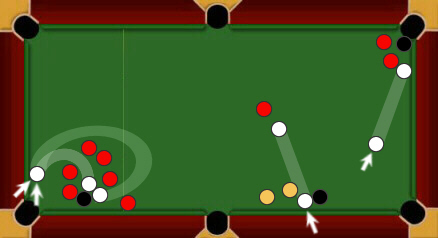 In a combination shot two or more object balls can be potted without penalty in a single shot. These may be balls from both groups and could include the black ball. So, to answer your question, if you are 'on' the black which you play and pot, then you win the frame even if you go on to pot an opponent's ball in that same shot. That is correct Dan, the shot you describe is legal and would win you the frame. No, two shots don't 'carry' as in certain pub rules and other lesser version of 8ball pool. In blackball its best to think of it, not as two shots after a foul, but as a free shot followed by a normal visit. If a player commits a standard foul, play passes to the opposition. The incoming player takes a free shot, before continuing with their visit to the table in the normal way. In taking that free shot the incoming player may then play the cue ball from the existing position on the table or choose to have the cue ball in hand. In which case the player plays the free shot from baulk. When taking that free shot a player may, if he or she wishes, first strike or even pot a ball or balls from the opponent’s group. Play then proceeds with the same player continuing with a normal visit to the table. Play passes to the opposition if that player fails to pot a ball. In fig 16. It states that with your "Free Shot" you can pot the Black. What happens to the Black once it is potted? I'm assuming that it isn't game over if there are colours left on the table, so does the Black get put back on the Black Spot? It says that any ball may be potted, including the black... if it is 'on'. An 'on' ball is any ball that can be legally played or potted. It is not legal to pot the black if any of the object balls from a player's own group remain on the table after the black has been potted. That would result in loss of frame. So when the black is legally potted the game ends. Any object ball is said to be 'on' when it is legally playable. What is an 'on' ball will depend on circumstances. For example when taking a 'free shot', after a foul, an incoming player may first strike any object ball including the black. So in that instance all object balls are 'on'. However if any foul is committed on the free shot (such as potting the black and balls from his or her her own group then remain on the table) it is loss of frame as normal. What is the rule about racking the balls to begin. Do you have to have the 2 reds at the top or does it matter if its yellows? It can be red or yellow. It's the relative positioning of the racked balls from the two groups which must be maintained. If it is obvious that it is a 'total snooker' do you need to seek confirmation that this is the case? e.g. If the player does not seek confirmation that it is a 'total snooker' and gets out of the snooker but does not contact a cushion after hitting the 'on' ball or pot a ball, is this deemed a foul? Always ask a referee or an opposition player to confirm you are totally snookered on a shot. This is the only way to be certain that your successful shot in escaping that snooker is not challenged or declared a foul. It can't be left to chance that your opponent or the referee was aware of the total snooker... no matter how obvious that may have appeared. In the situation you describe a referee would correctly call a foul. Great detail on the black ball rules thanks. I had an unusual situation, after a dry break the cue ball ended up on the top of the side rail. On the cloth part. We didn't know what to do so my opponent played the ball from where it stood. I.e. stroked it off the cushion top onto the table to hit a ball. Was this correct? Hi, that is a standard foul and the incoming player should play from baulk with a free shot. Hi, how are balls racked following a stalemate? Also, who breaks the re-racked balls for example if the stalemate happened by design? In image 12, if the red failed to follow the black into the pocket would that be loss of frame or is it respotted black? If red does not also drop into pocket it would be loss of frame. If the object ball moves it is a foul. I was wondering if you could help me with a ruling. Playing black ball pool with a friend and I had one colour remaining (yellow) and they were on the black. On their shot, they were trying to get play a nearly straight black into a corner pocket, but just touched my yellow ball first on the way through to their black. The black ball potted. But I was wondering if a foul should of been called? As the wrong object ball in his case was hit first? Cheers, Tom. If they were not on a free shot following a foul by you then this is a 'loss of frame' foul. 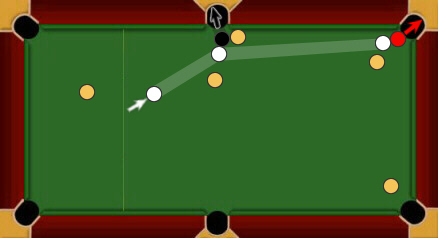 A black potted on a shot in which a foul is committed results in loss of frame. In this case the first ball struck (yellow) was not an 'on' ball. On the website under 'Standard Fouls' one is 'The tip of the cue ball is still touching the cue ball when the cue ball contacts an object ball', however on the 'World Pool Association Official Blackball Rules' A3 poster this standard foul does not appear. Is this an omission or are there variants on the rules? The rule you quote did appear on the WPA website at one time. That's why it was included on a page on this site. However after checking it no longer seems to appear on the WPA site. The wording of blackball rules has been changed a little over the years although there have been no major changes to the actual basic rules of play. 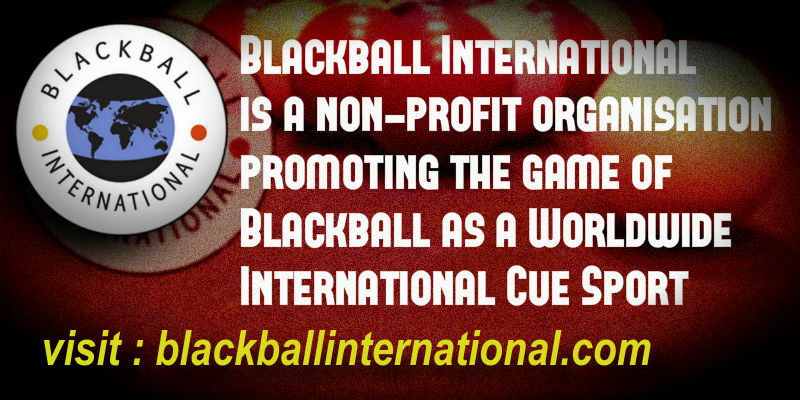 The rules are laid out and worded a little differently on the Blackball International and the WPA website. The A3 poster wording is fairly close to that on the Blackball International site and promulgated by the IPA. These differences in wording, although minor, are not very helpful! The quoted rule may have been an attempt to better define push shots and fouls which result in not playing away from a touching ball and which cause the touching object ball to move. Looks like it would be just as well deleted from this site. Hello! I have a question about Image 19 as it's not clear. There are 3 scenarios and it permits all but the last to be deemed a stalemate. Is this just because it theoretically (however unlikely) could fit between the reds to reach the black? On the same scenario (top right) could the player have not taken a free shot to free access to the black then hit the black, or would this only be permissible if the opponent commits a foul? Steven.... any jump shot in which thw cue ball passes over an object ball is illegal in blackball and results in a 'standard foul' being awarded. Starting from top right. In blackball rules a free shot is not permitted except, as you say, unless an opponent commits a foul. Assuming no foul has been committed that scenario is a stalemate. In the instance where the white is touching the black, the referee might be required to make the judgement as to whether the white can pass through the gap between black and yellow. If the referee deems that it can do so then the shot must be played even though the successful execution of such a shot is exceedingly unlikely. Finally, bottom left, it is evident in this case that the cue ball 'could' pass through gaps to reach the black so a shot must be attempted. As regards WEPF 'world rules' and blackball that sums up major differences. 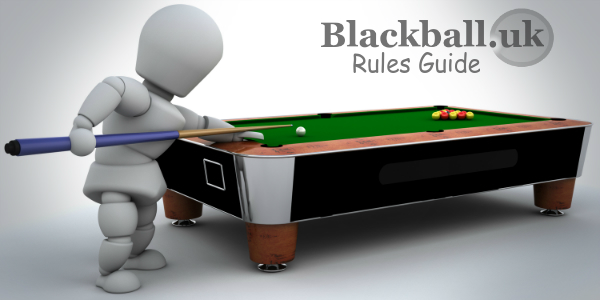 When playing to blackball pool rules on any shot when the cue tip does not touch the cue ball the same player may continue and complete the shot. Assuming no other part of the cue strikes the ball. A controversy which could arise is if there's uncertainty about whether the cue tip did or did not touch the ball in the attempted shot. That relies upon the sharp eyes of the players or referee to determine... and of course the honesty of the player taking the shot! If there is just the slightest of contact it is a foul if the subsequent requirements of a legal shot are not then met (ball potted, ball strikes a cushion, etc). If the shaft makes contact with a cue ball on a shot (whether the cue tip first makes contact or not) it is always a foul. Regardless of intentions... but again it may be difficult to determine exactly what has occurred. When playing to blackball rules after a standard foul the oncoming player is entitled to one free shot followed by a normal visit. On that free shot the player may strike any object ball. So if there are none of the player's own group balls remaining on the table then it's legal to strike an opponent's group ball in such a way that it pots the black and wins you the frame. However that's not allowed on any shot in the visit following a free shot and would result in loss of frame. 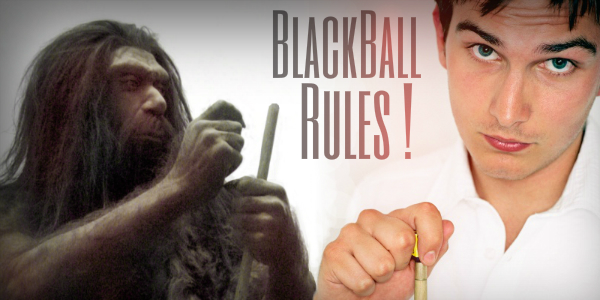 ive just been reading your rules for blackball and you have done an amazing job. i congratulate you on that. can i point out to you though that in rule 9 that your stating that when re spotting balls on the table you state its black then red then yellow but then u say " When not an open table a black ball is again always returned first but is followed by any ball or balls from the group of the player just about to play... that is of the 'on' player. . this is not true and needs ammending. What is the rule on push shots? Are they Legal? The content regarding re-spotting balls was only changed recently above. It actually reflects the current wording on the World Pool Association (WPA) website regarding blackball rules. It has been re-phrased in such a way as to only refer to black, red or yellow balls (not blue and solids as mentioned on the WPA site). The problem is (and this really needs to be addressed) that since the original rules were published in 2005 they were changed just a little in 2008 and have apparently been tweaked even more subsequently... and the WPA website updated accordingly throughout that time. The consequence is that the Blackball International website and various other organisation still promulgate the 2005 rules... which as mentioned now differ (although only a little) from those published on the WPA site. Fortunately the difference in this case only becomes relevant in the unusual event of balls from both groups needing to be re-spotted simultaneously. Wayne : What is the rule on push shots? Are they Legal? ...Any play in blackball deemed a push shot by the referee is illegal and a foul. Wayne's question on push shots links quite closely to my post dated 16th May 2017. In my question I did not specifically mention push shots but the 'Standard Foul' I mentioned 'The tip of the cue ball is still touching the cue ball when the cue ball contacts an object ball' (see this website http://www.blackball.uk/2017/02/blackball-rules-summarised.html - Blackball Rules Summarised) would be better placed under the definition of a push shot and included in the 'World Pool Association Official Blackball Rules' A3 poster. If a foul shot is made and the opponent is now "on" black , does the opponent effectively have two shots at the black? On any 'standard' foul the oncoming player has "a free shot followed by one visit." So, yes, if the player is 'on' black then he/she can take two shots to pot that ball. Hi, a few questions please? 1) When taking a free shot after the white has been pocketed by your opponent, where can you place the white (anywhere behind the line or in the D only or)? 2) do you have to play "up" the table when taking a free shot after the ball has been pocketed and replaced on the table? 1) There is generally no 'D' on those tables installed to play specifically blackball, however the ball may indeed be placed anywhere in baulk (behind the line). 2) The cue ball can be played in any direction having been placed in baulk. 3) On a free shot any ball can be struck. It's also possible to pot any colour of group ball. So in your example the yellow may be potted, however the remaining red in your own group must of course also be potted before you can pot the black. 1. after a foul of potting the cue ball how far from any object ball that could be within the baulk should i place the cue ball to play a free shot. 2. on touching and frozen balls who should advice one another that the balls are touching or frozen between the player and the Umpire? 3. how does the Umpire declares that the match is over and has been won by this player. and when exactly does he do it? 1. The cue ball may be placed in baulk as close as you wish to any object ball... that is as close as is practicable without touching. 2. If there is any doubt, a player should as ask his/her opponent or a referee (when present) to confirm (or refute) a touching or frozen ball. 3. A match will consist of a specific number of frames so it will be clear when a player has attained the required number of frame wins. After a successful break, the next player potted a yellow ball, in the process of potting that yellow ball he made a foul. My question is, is it still an open table or a closed table. Hi... An open table remains open if a ball is potted in a shot where there is a foul. Player A is on reds and has ball near pocket. Player B attempts to pot black past red but rattles it. Player A legally pushes another red into the mix, leaving a snooker with a small gap that can be reached via a couple of cushions. Player B has to attempt escape, so plays off two cushions and leaves white maybe eight inches short. He's may well have gained an advantage by leaving his opponent a very smelly shot, but if he played his escape attempt harder he could easily have lost. Tough call for the ref to say DF even if he suspects it was. Yes Phillip, it can be a difficult decision for a referee... a somewhat objective decision must be made as to whether sufficient effort has been made to escape a snooker. 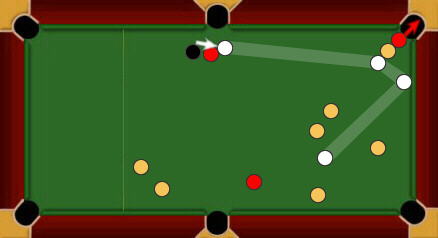 The difficulty of the shot, how close the player comes to escaping the snooker and even perhaps the ability of the player (if known by the referee) could be factors. Figure 17 in the 'visual guide' depicts such a situation. That is showing Hartlepool League, any website link, email address or even a logo? Just email ukpool@gmail.com with details if so. Hi. i have a question. If on the black ball as the last ball to pot, if you miss the balck ball as its the last ball, is it a foul and the opposition player gets two shots or is it one shot for the opposing player? Many thanks. Would this be deemed a legal shot or a deliberate foul if you were on reds? Just caused some debate as a legal shot is determined as contact with a red and a cushion after contact and it's obvious no attempt has been made? Hi the link is a post to a video which caused some debate as to whether it's a deliberate foul the definition of a legal shot is make contact with an on ball and hit a cushion after contact - there was no attempt to hit a cushion in that shot and laying a snooker it created some debate as to whether it constitutes a deliberate foul or not. Any ideas? Hi Jamie... that facebook account is a closed group so unable to view video. That is a standard foul and the oncoming player has a free shot followed by another visit (effectively two shots). When breaking say I pot either a single red or yellow ball, is that the colour I then need to play?